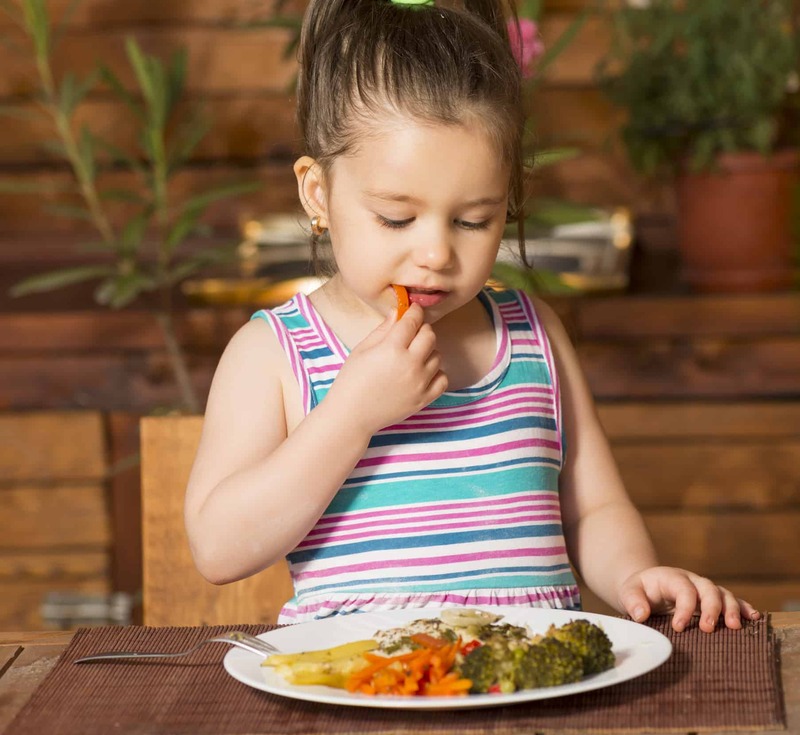 Getting kids to eat vegetables can definitely be a challenge, but think of it from a kid’s perspective: How could vegetables possibly be good, when they are put on the side of the plate (not the middle) and only touched with a fork? If you think about it, they seldom are even touching the rest of the dinner. Here’s a suggestion: keep the vegetables in the middle, let kids eat them with their fingers, and even let it be fun. My kids, now grown, pointed out to me once that the way I ate vegetables is not typical, but they loved it, and talk about how much fun they had as children playing along with me while we ate. Making vegetables fun to eat can really make a difference. I was raised not knowing anything about the nutritional value of broccoli. What I did know was that they were in fact trees, and I was a giant. I could eat them whole, crown first, chomping down on them and enjoying the destruction. Cauliflower was the same. Crowns were eaten first, and the smallest pieces popped into the mouth whole. I worried about the villagers as I ate their forest, but only a little. I was a giant. Giants are hungry. Brussels sprouts were in fact whole cabbages, which giants also like to eat whole. Giants need to eat lots of them, because they are pretty small compared to a giant. Asparagus was to be slowly gnawed, with the tip going into the mouth last, and the tip can stay sticking out just a bit before it is also eaten. They were not trees but tree trunks, maybe from palm trees. Sugar snap peas were eaten whole, and when the shells were tough I was taught how to put the whole shell in my mouth and pull it out through my teeth, squeezing out the peas and leaving me only holding the shell. That took practice and eating lots of peas to master the skill. And spinach: we still, all of us, believe just a bit in Popeye and the magic of spinach. I ate it cooked, even though I didn’t like it, convinced that somehow, I was going to gain superpowers if I just ate enough. I knew I didn’t like it, my mother knew I didn’t like it, but she would still encourage me, suggesting I add a drop of vinegar or a sprinkle or salt before my next bite, just to see if it tasted a bit better. Let your kids develop their own stories to make their food more exciting, let them eat it with their hands when at home, and see if they start to have a bit of fun with it. Let them have some control over the process, maybe being allowed to add a bit of lemon juice, vinegar, or oil to make the flavor different if they truly don’t enjoy it. You may just be successful, but if nothing else, you’ll have a bit of fun too! Do you have some creative ideas or tricks you use for getting kids to eat more vegetables? Tell us about them in the comments section below – we’d love to hear from you! Great ideas! I had a cousin who had to sit at the table until she ate all her peas and as an adult she still remembers the power struggle involved. Maybe if they had been little cannonballs shooting into her mouth things would have gone better for everyone involved. Childhood imagination lasts a short enough time – using it to enhance eating, which is such a nice experience in itself, is brilliant! Jane: good insight! I hadn’t thought of cannonball peas before. Anything that makes it more of a game can work. I know I pretended I was a bunny quite a bit when I was young … bunnies love their lettuces and even though they nibble and make lots of sniffling sounds, they do eat all the vegetables on their plate.